Edible art. This is a really remarkable and attractive potato, and we've never seen anything like it. This skin of this one-of-a-kind bicolor is a brilliant contrast of purple and white biomorphic shapes. Moist, white flesh perfect for baking, mashing and roasting. Very high-yielding. Plant Variety Protection Pending. For Home Garden Use Only. Potatoes are fun and easy to grow in the garden and even in containers. Their creamy nut-like flavor is heavenly. 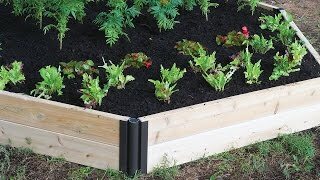 Plant potatoes directly in the vegetable garden as soon as possible after you receive your mini-tubers. Potatoes are a cool season crop and mini-tubers should be planted prior to the last expected frost in spring if possible. Potatoes may also be grown as a fall crop in milder regions. Select a location in full sun with good rich moist organic soil. Make sure you did not grow tomatoes, peppers, eggplant or potatoes in the bed the previous year to avoid disease problems. Potatoes prefer a soil pH of 4.8 to 6.0. Avoid poorly drained soils. Do not plant potatoes in freshly turned grass sod to avoid wireworms. Plant the entire mini-tuber, do not cut it up into smaller pieces. Lay the mini-tuber in a trench 4-5 inches deep and 6-8 inches wide and apply a light fertilizer at the bottom of the trench. Space the potatoes 10 to 12 inches apart with eyes up and cover with 2 or 3 inches of soil in rows spaced 2 feet apart. If there is danger of frost cover the rows with newspaper until the shoots are 3-4 inches tall or the danger of frost is over. Plants emerge in 4-6 weeks. When plants are about 5 inches tall, hill up the soil from the sides of the trench around each plant almost covering the foliage, but allowing 2 inches of foliage to remain above the soil. Continue this hilling process as the plants grow, usually about every two weeks. The hills keep the plants cool and prevent the potatoes from forming near the surface where light will cause the tubers to turn green and become poisonous. Hilling suppresses weeds and keeps roots deep in the soil where more moisture is available. Keep weeds under control during the growing season. Weeds compete with plants for water, space and nutrients, so control them by either cultivating often or use a mulch to prevent their seeds from germinating. Cultivate carefully so as not to bruise or cut the young tubers forming just below the soil. It is important to keep plants well watered during the growing season to ensure enough water for potato development. They prefer 1-2 inches of water per week, more during hot, dry spells. Uneven growth caused by periods of drought when the tubers are forming (around flowering time) will decrease production and result in knobby, cracked or hollow tubers. Use a rain gauge to check to see if you need to add water. It’s best to water with a drip or trickle system that delivers water at low pressure at the soil level. If you water with overhead sprinklers, water early in the day so the foliage has time to dry off before evening, to minimize disease problems. Keep the soil moist but not saturated. In areas with sandy soil additional side dressings of fertilizer may be needed when the plants are about 12 inches tall and flowers first begin to appear. Potato hills can be bordered with rows of other cool-season vegetables such as cabbage transplants, direct-sown lettuce, celery, salad greens and root crops, onions, overwintered herbs, nasturtiums, and strawberry plants. Harvest “new potatoes” as soon as plants begin to flower, about 10 weeks after planting. Harvest mature potatoes about 15 weeks after planting. When harvesting new potatoes work carefully to disturb the plants as little as possible. With your hands and a trowel gently lift the top layer of soil or mulch around the plants and pick as many potatoes as needed, then replace and firm the soil or mulch. Take only a few of these immature potatoes from each plant. The remaining potatoes will continue to grow and provide your main crop. For best flavor and vitamin content, plan to use new potatoes immediately after digging. 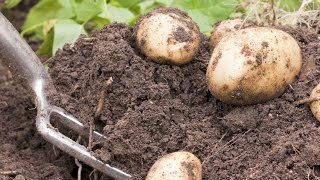 Dig mature potatoes for storing 2-3 weeks after the plants turn yellow and die back. Use a spading fork and work from the outside edge of each row, turning the soil over carefully so the potatoes are not damaged. Most of the crop will be in the top 6 inches of the soil. Harvest on a sunny day and leave them out to dry for an hour. After harvesting store them in a dark, dry place for a week at 65-70 degrees F. Then store them at 35-40 degrees F out of the light. Note: The leaves of potato plants are poisonous to humans and animals. Potato, Masquerade is rated 3.8 out of 5 by 6. Rated 5 out of 5 by mslunt from I really like these potatoes! These potatoes were great. Best yield of all of mine including Yukon Gold and others. They weren't real large but that's because I planted them in mid June due to this being the first year we worked this land. My wife loved them. They were very good to eat and we still have some in storage that are in great shape. The only thing I would say is mine weren't as pretty as the ones in the picture. Not as purple but still an interesting look. Rated 5 out of 5 by FarmerDan from Good So far I am trying Masquerade for the first time this year. I planted them September 1st here in New Jersey. Five weeks later my plants are a foot tall. I have at least three more weeks of 60 degree weather and plan to keep them in the ground to harvest as I need it. Rated 5 out of 5 by chihuahuaman12 from Cool Turnipotatoes! I chose to grow this potato for the same reason most people have... the awesome colors! If you know how to, these are very easy to grow and give you lots of colorful potatoes. They average the size of a lemon. The colors remind me of the purple top white turnips. I bought 10 tubers, which are basically mature potatoes left in the ground a little longer, and all formed beautiful 3 and half-foot tall plants. I dug a 100" long trench 4" deep and 2' wide. Place the tubers 10" apart in the very bottom of the trench. Cover the tubers with 2" of the soil lining the trench. Pat down the soil and sprinkle with water. In Zone 7 where I live, I sowed my tubers the first week of April. The sprouts came up from the potato eyes in 1 or 2 weeks. Do Not excessively water the potatoes or else they will rot underground. The sprouts and plants have dark green leaves and small streaks of faint purple at the leaf tips. When your sprouts are half a foot tall, mound the rest of the trench's soil and some mulch around the stems of the plants. Do this as they grow larger. This step is really important! If not done, the potatoes will be unburied and exposed to the sun. Sunlight will turn the potatoes green. Green potatoes are poisonous! Don't die of green potatoes. You can save your life with 40 lb. of soil for a buck at Walmart. And also don't die by lugging those heavy bags of soil. Potatoes form on the part of the stem that is buried. The foliage will grow to a tall 3 and half feet and have little purple flowers with an orange middle. The leaves are shaped like spades. Although flowers mean the "new" potatoes are ready, I don't suggest harvesting them because they are pretty small and you can't harvest all the "new" potatoes because then you won't have anything in the main harvest. When the dark green foliage dies back or has a very little amount of leaves left, it is harvesting time. This happened to me in early August. To harvest, pull up the plant out of the soil. The dirty potatoes will be entangled in the roots and stem bases. Pluck the potatoes from the roots. With a garden tool, push the soil in the trench into the sides so that it lines the trench. You can use that soil for potatoes next year; the trench is already set up. Usually, some potatoes won't stay with the plant when it is pulled. To get the potatoes left behind, very carefully use a handheld shovel, handheld spade, pitchfork, etc. to dig for the potatoes in the soil. Bring your harvested potatoes into the kitchen sink to wash them. Rinse all the dirt off. Next use the abrasive side of a kitchen sponge to scrub the white parts of the potatoes, NOT the purple part. Scrub till the white part of the potatoes changes from beige to white. To clean the purple part, very lightly scrub it with the abrasive side sponge. Rinse the potatoes again, and now you can take pictures of your clean bicolor potatoes. Now you can cook your potatoes. I suggest cooking potato halves on the stove. Unlike some purple and red fruits and vegetables, such as beans, the purple sections of the Masquerade potato stay purple even after cooking. That's one reason I wouldn't suggest mashing. The insides are white. You'll get about 3 or 4 large potatoes per plant and a couple small ones. Enjoy your cool purple white bicolor potatoes! Happy Planting! Rated 5 out of 5 by Queenchick16 from Behind the mask What great potatoes behind the mask.....delicious.. I've used them in potatoe salad, and roasted with rosemary .slightly larger then the jumbo eggs my girls give me and many per plant. Just as described. Can't wait til next year. Rated 2 out of 5 by TammyW from Not What I Paid For I planted on 4-27 and pulled a few 7-29 more than enough time according to the description of 60 days. I have potatoes about the size of large eggs, one or two per plant, BUT they are plain looking. There was no blue or purple to them - they look like little light yellow potatoes. They tasted fine. The vines were huge and spreading with very beautiful deep violet flowers with orange centers. I received many comments about the vines. One neighbor called them potatoes gone wild. I'm disappointed that they aren't the unique, colorful potatoes I paid for. Gave them 2 stars because they did grow really big vines with nice flowers. Potatoes are ordinary - but better than none. Hope Burpee's fixes the issue with these. I'd like to try them again. Either advertise as plain potatoes and sell them cheaper or make sure they turn out like the pictures in the catalog. Rated 1 out of 5 by Teerarah from Dissapointed I plant potatoes every year and have great results. My gold yukon were huge and were bigger than my hand. I was looking forward to trying these potatoes and expected high yield based on the description. I pulled up my 5 plants and found that most of the potatoes had begun to sprout - the flowers just died back last week! I got no more than 1.5 pounds from the 5 plants total! This is one variety I would never try again.